Mountain Men consists of trappers, travelers, and explorers who roamed the North American Rocky Mountains from about 1810 through 1880's. 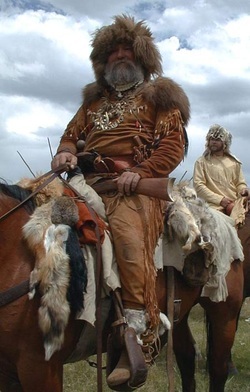 A typical mountain man usually sports a bushy facial hair and dressed in buckskin and a coonskin cap. They also wore woolen hats and cloaks with Indian style leather breeches and shirts, and often wore moccasins. They live in the mountains and swamps that's why they're ethnically, socially and religiously diverse. The Rendezvous system started at Horse Creek on the Green River, which is now called the Upper Green River Rendezvous Site in Pinedale, Wyoming. By the mid 1830's, there were about 400-500 men who engaged in barter, trade, selling and swapping of different kinds of items such as skins, pelts, guns,and other supplies that they needed. The rendezvous lasted from days to months and it was a time to get new supplies, renew acquaintances and swap stories. Today, Mountain Men Rendezvous are held to re-enact events and preserve the history and culture of Mountain Men. The 1838 Mountain Man Rendezvous - Riverton, WY. Overview: Rendezvous will be held from July 2 - 6, 2014 on the original site in Riverton, WY. If you would like to add your Rendezvous to this calendar page please contact us and we'd be happy to add your event. There is no cost to add your event and website.